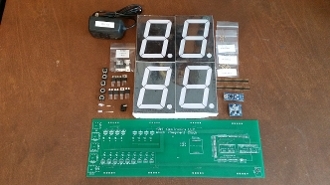 This Multi Purpose High Visibility Open Smart Numerical Display Kit, (Kloc for short) is the first of its kind allowing you to use either of the following 4 Arduinos to control it: Arduino Uno, Arduino Mega2560, Arduino Nano or Arduino Pro/Mini. With its 4 4 inch 7 Segment displays, that come in Red or Blue, it is visible from a great distance. It provides Bluetooth control and has 5 buttons to select the mode of operation. It displays the temperature in Farenheight or Celcius, it is a countdown timer. a triggered counter, can accept remote temperature sensors and remote buttons. Oh, it also displays the time in 12 or 24 hour format.